Rainy days ... a garden glows in the warm sun, but it can't grow without rain. A warm, rainy day in June can be lovely, but at the tail end of March, it's a bit depressing. It's still cold for early Spring here. Snow cover is melting, but the soil is wet and muddy. So, I think I'll take a stroll through my summer garden with photographs. Heavenly Blue Morning Glory, such a pretty blue. Not that violet blue color. A true sky blue flower. Easy to grow, but a late starter here in the mountains. Yet, I remember they lasted til frost. Poppies! Bright colors and soft, crinkly petals. Another easy one to grow. They don't mind chilly temps. Actually, one of the best ways to sow them is to sprinkle poppy seeds on melting snow. I like to grow mine in my garden and in flowerpots. Such cute flowers with such cheerful, little faces. 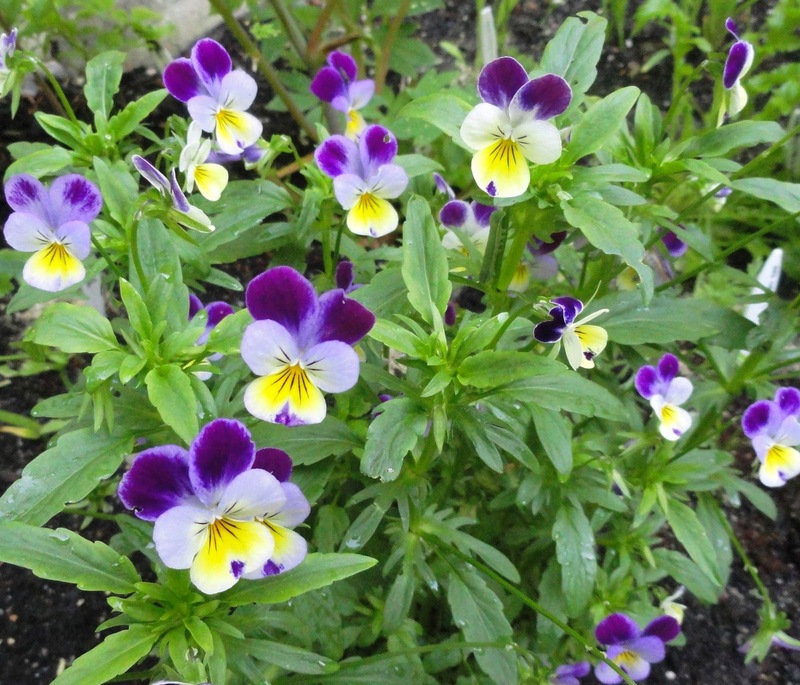 Viola, also known as johnny-jump-ups, don't usually make an appearance in my garden til late May, early June. They like the early warm summer days, but begin to fade when it gets too hot. Mexican sunflowers bloom all summer in my garden. They love the sun and hot weather. Their leaves are soft and velvety to the touch. Butterflies love them, especially the Monarchs. Snapdragons come in many colors and sizes. I usually grow the dwarf variety. I usually winter sow these to get an earlier start in the season. And what would a garden be without a rose? I've only grown the minis and only in pots. I tried growing roses in the garden, but couldn't keep the deer away. Sigh. Hmmn ... of course flowers are not meant to be enjoyed only in the garden. Fresh cut flowers, whether a store bought bouquet or picked from your very own garden, will always brighten a rainy day.